I was invited by the FLOSS event Swatantra 2017 (in Thiruvananthapuram, Kerala, India) to talk about Pepper&Carrot! My talk will be on 20 December at 14h00 and I'll talk about the creation of the artworks and pages on Pepper&Carrot episodes. It will be for sure the longest trip I made for a Pepper&Carrot talk. 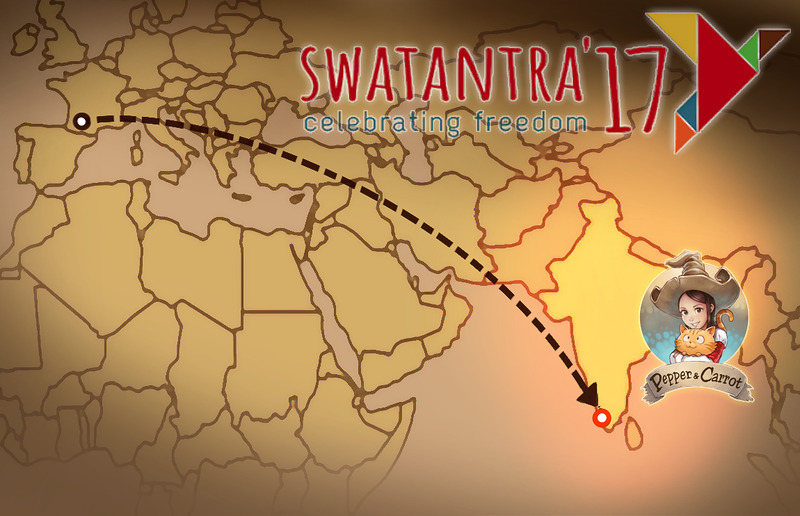 Also on Swatantra 2017 you'll meet a very interesting panel of talks: RedHat, Krita, GNOME, Purism, GNU Health, FSF India, Blender, Gcompris and more. I'm really honored and excited to participate to this event, I hope to meet a lot of Pepper&Carrot reader from Kerala! Congrats and stay safe in the travels! Too bad I read this late. I live in Trivandum and could have come. Great news, David, I hope there’ll be a video file of your presentation that we can download.